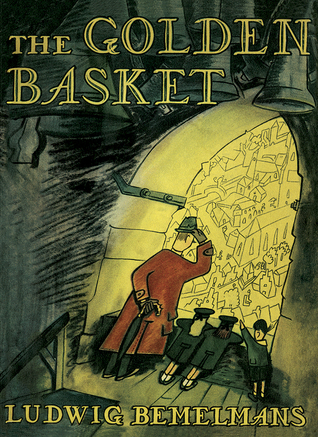 The Golden Basket by Ludwig Bemelmans is a short novel my husband borrowed through inter-library loan. I only had access to the book for one evening, during which I devoured the wonderful story of Celeste and Melisande, two sisters who stay for a few days in an inn in Bruges, Belgium with their father. Though the plot of this book is ostensibly about the girls' friendships with some of the people they meet at the inn, it is truly a kids' travelogue for Bruges. During their stay, the girls are taken to a carillon and a cathedral and given a ride on a boat. These visits are described in detail, as are more general aspects of their visit, such as their arrival in their room at the inn, and the way the sunrise looks on a Belgian morning. The descriptive writing is very beautiful, and a complete joy to read aloud. This book also appears to be something of a prequel to Madeline. During an outing, Celeste and Melisande encounter a spirited little schoolgirl named Madeleine, who has trouble minding her teachers and says “Boo-boo-boo" to everything. This character seems to evolve a bit before starring in Madeline, published three years later, but clearly it is the same little girl, with only a few minor changes. The back cover of the book shows young Madeleine leaning out of her classmates' neat line of march in order to run her hand along a stone wall - this illustration could just as easily be a page taken from Madeline itself. With or without this teaser for the Madeline series, The Golden Basket is an absolutely delightful book. I read a large portion of it aloud to my three-and-a-half-year-old and she was completely drawn into the world of the story. I imagine she would only be more engaged if she were a bit older and had the attention span to sit through the whole thing. I just can't say enough good about this book. If you have the chance to read it, do. There is no way it can disappoint.